Our pastor is doing a series about the 10 commandments this summer. Our children's curriculum is following that series so the entire family hears the same thing each week. A few weeks ago was our turn to teach the kids. We even got to choose which commandment we wanted to teach on. We thought teaching the Sabbath would be easy...but to children? As we thought about it...do no work...rest...take time to do nothing and reflect...we thought about our kids...WHO DO NOTHING! Haha... don't take that the wrong way. Our kids have and do chores. They have animals that they care for. They maintain their own rooms. They do things for our elderly grandparents. But not without being asked. Not without direction to do so. If we let our kids just go for a day they will find random devices to play on or jump on the trampoline for hours or draw/write in their rooms or just plain play/waste the day away. It irritated me that I was thinking my kids whole lives are Sabbath! So we thought and pondered some more. This is not a direction given to adults only. My kids have relationships with God so it is as much for them as for me. So what did we learn in trying to teach kids about keeping a Sabbath? 1. It does not have to be a certain day. 2. Kids are great Sabbath keepers. They are not bound up in the busy busy American lifestyle. They live to relax and recharge. 3. I need to watch and learn from them...there is a time for everything. A time to play, a time to dance, a time to clean, a time to let it go! 4. During certain times of the year Sabbath moments are all we can get. My kids are busy during school and more relaxed in the summer...my schedule is always full but I can find a moment to redirect my thoughts to Jesus. 5. Sabbath is not just a relax and do no work day. It is a set aside (holy) time to reflect on Jesus and HIS work and worth in our lives. 6. Kids know how to relax but need to be trained (as we all do) to be intentional about focusing on Jesus. a. Late afternoon (almost) every day Mike and I sit down together and have a glass of something and just be...if only for a few minutes. f. Just that 5 minutes before we fall asleep. I could go on and on because this taught us to look for and appreciate those moments. Those moments where we can make it an intentional Sabbath. We want to teach our kids that "down time" can be productive in our relationship with Jesus and to the kingdom of God. So Happy Sabbath Friday! Here in Western Colorado rain is a big deal. I live at 7,800 ft above sea level; I live in high desert. Pinion Pines, Prickly Pear and Sagebrush dot our landscape. Most of our moisture comes in the form of snow in the winter... and in the form of rain in late July and early August. After the dog days of June and July, hot and dry, fire fears, and sun burns; rain is life. Today as I packed up my things to go and listen to children, I could smell the rain coming. It's like the sagebrush let off their sweetest smells in anticipation. The cats burrowed in the hay, the goats bedded down. All the earth knew rain was coming and prepared accordingly. The horses were feeling it too, they ran the length of the fence to show me so. I arrived at my destination and set up my things, invited a child in and listened, Holy Listening. Rain. Rain was on the lips of the children. "What is it about the rain?" I asked. "It's like what new feels like," said one. "It's like God's says 'shhh. I've got something to say,'" said another. "I like to play outside when it's raining. Have you felt it on your face?" asked a boy. "Well yes, when I arrived." I said. "No, not like that. When it's on your face and your just there to catch it," he replied. Humm... when was the last time I stood out in the rain just to catch it. Just to hush up and hear God's whisper through water, to feel with my skin what new feels like. Teeth brushed, drinks given, I asked my own children, "Where did you see God today?" "In the rain," they both said. "It's like this, Mom. Rain is like how God wants to help us be like Jesus. It's strange because, well, people are mostly dry. We know rain keeps us alive and we know we need it to keep clean, but it's so foreign and God knows it so he gives it to us in little bits." And a little child shall lead them... I think I'll go sit outside, I hear thunder. *Just in case you are wondering... the children gave me permission to use their words. My eldest daughter's favorite prayer book is Richard Foster's Prayers From the Heart. We have been working the opening prayer into our days lately and thought you might find it helpful. Until new life buds and opens and flowers. Richard Foster, Prayers From the Heart. Harper One:New York 1994. 3. I have come to believe that children exists not for the purpose of becoming adults but rather for the purpose of reminding adults how to be childlike. Let me illustrate. Several weeks ago my husband shared with our mission community about the importance of remembering Emmanuel, God with us. It was a short sermon, mostly challenging us on how we live out every day in this awareness of God being with us. Later we were discussing what this means to us and my six year old shared that it’s like sometimes when he is sick, he forgets. He forgets that God is with him in that moment. Such simplicity and yet so powerful truth there. As much as I abhor the thought of my three year old tromping through the bush by herself, I am so thankful that she knows no fear. I love the fact that she isn’t unaware of the danger but rather confident of the constant presence of Jesus, so there is no fear in that danger. I have been so challenged by her complete confidence and rest assurance every day that Jesus is with her. Through Good Dirt, we aren’t just trying to teach our children how to have a family devotion or a daily quiet time, through those things are good, we are trying to teach them how to make God apart of their everyday, every moment of life. Yet, who would have known that instead they would be teaching me these very things. That moment when I am scared or unsure, how easy it is to forget Emmanuel, yet, this beautiful princess in my sight is a constant reminder that indeed God is with us. I've just returned home from bringing two of our boys to church camp for the week. Our other son is already away for a second week of training for a children's evangelism ministry he's taking part in this summer. And so, the house is quiet. We brought a neighbor boy and two neices along to camp, and all the way home as I drank in the blue Colorado sky with forests of evergreen and aspen, roadside streams and meadow flowers stretching mile after mile, I thought about each of the kids and each of their little personalities and passions, their gifts and their callings. 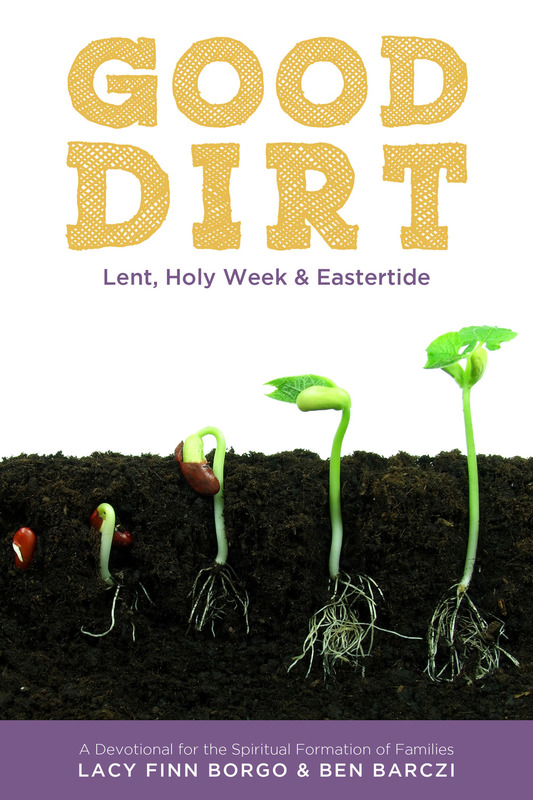 We read Good Dirt and the Bible this morning after final packing, and the passage we read from Luke 20 talked about a vineyard and unfaithful workers who mistreated all the servants sent by the owner of the vineyard to bring back fruit. They even killed the owner's son. "Instead of drawing the unfaithful workers, draw a picture of you working with God in his vineyard," Good Dirt instructed the boys. "How do you feel to be working with God? How does God feel to have you working with him." And this drawing above is what my 8-year-old sketched very quickly. A big God and a small boy, working together in a vineyard, with God's response about how he feels to have Derrin working with him--an imperfectly spelled "PERFECT!" As I drove today I thought about my own process as a girl and young woman of learning who I was and learning how my growing passion for God could best be lived out in this life He'd given me. I remember road trip vacations as a child when we listened to a couple cassette tapes of country music over and over and over to pass the time--and how I realized later that this style of music, though my parents' favorite, definitively was not "me." I remember my dad's encouragement toward the study of law as I entered college, and how I wrestled with his prompting but determined I wasn't created for this profession. Just two random examples, but they remind me that my kids, and each child I know and love, is created to meet God in particular ways and to work alongside God in ways fitting so rightly for him or her. I pray this week that my two boys at camp, and my teenager sharing the Gospel with kids, will keep learning who they are and how they can best meet God. I pray they experience ways of loving God and worshiping him where they're at this week that fit who they are. And I pray they learn just a little more about how God has formed each of them to work with him in his vineyard. The place God calls you to is the place where your deep gladness and the world's deep hunger meet." I pray they pursue a life where they know God is smiling as he works alongside them, even in them, and where they sense him whispering something along the lines of "Perfect!" as they are glad together. Last week as we read Good Dirt and focused on the passage from Luke 11 where Jesus teaches the disciples to pray with what later has come to be known as the Lord's prayer, we talked with the boys at some length about how God always answers prayer. We've talked about it many times, but again there was some argument. "Well, God doesn't always answer prayer, like if you ask to become a millionaire. God might not answer that prayer," offered one of the boys. And then we talked about how God may answer by saying, "No, I know what is good for you and I want to give you my best. I am not going to make you a millionaire but I will make you rich in other ways that will bring you much more joy." And then we talked about how as we grow closer to God we begin wanting what He wants for us more than what we in our limited understanding can want for ourselves. We begin to have God's desires for our life rather than our own desires. And then we talked about how Jesus taught his followers to pray for their everyday, usual needs. Our prayers don't have to be complicated. They can be simple. And we talked about what some of those everyday needs are. The boys reviewed the ways we pray from day to day--asking for help on a test at school, asking for healing from illness, asking for guidance in making a decision. And after that time together and as the week proceeded, I began to think about how in parenting, with all the changing of our kids' stages of life and with all the challenges we have in knowing how to parent a child who is different from us, with all the waiting of months or years to know whether the decisions we are making now in parenting our kids are going to end up being the right ones to help guide and mature them--with all these unknowns it's a big comfort to remember that God always answers our prayers. Mike and I got a glimpse of it twice this week with our teenager. An issue we have prayed about for years and not known if we were deciding rightly in the way we have gently but firmly kept him involved in something he didn't want to be doing has come full circle. He has suddenly embraced it and is seeking further involvement on his own and it's meeting a place of passion inside of him. Another issue as well, he has embraced after some off and on complaining and resistance. There has been much comfort not in feeling like "we were right" but in the realization that yes, God answered all those prayers, day by day, about how to guide him. In the end, it doesn't matter so much whether Collin stays involved in these particular areas or not. What matters is that we've tried to put our need before God and then follow the ways God seemed to be leading. The rest is up to God and He will take our child where He wants him to go over the course of his life if Collin learns to follow daily the leading of the Spirit as he places his needs before God. "Father, hallowed be your name, your kingdom come." Thank you for teaching us to pray, God. And thank you that you always answer. During the summer these words bellow from the porches and couches of millions of homes in America: “I’m bored.” Every kid in the free world, having prayed fervently for school to end, is now proclaiming that the day of perpetual boredom is here. In our culture the tendency is to fill up the summer with camps, classes, and distractions of every shape and color. What would happen if we halted our planning and pondered the wisdom of Kingdomtide, or as it is traditionally called, Ordinary Time? What is ordinary? Oatmeal for breakfast is ordinary. Laundry, the sun coming up, rain, reading to my kids, mowing the lawn, feeding the chickens, making the bed, napping on Sunday—all ordinary. Without these ordinary actions, our lives lose a sense of rhythm. In fact, without the ordinary we don’t grow, not physically or spiritually. There is nothing fancy or fabulous about a meal of beans and cornbread, except that it sustains our bodies, and thousands of people eat it every day. It is an ordinary meal that does extraordinary things. The fact that the sun comes up every day is an ordinary event most of us ignore, but without it nothing could live. Jesus was so fond of teaching out of ordinariness, over dinner, in a wheat field. He taught the foundational truths of the universe out of an ordinary body, using ordinary words, to ordinary people. For six seasons now, we (Lacy and Ben and you!) have looked forward and backward; we’ve celebrated and mourned. Now, during Kingdomtide, we settle in: we find our stride. For 29 full weeks we all have the chance to establish a family rhythm that will grow us and ours. Many families practice the spiritual discipline of vacation during Kingdomtide, but for most vacation is just one week in the midst of 29 weeks of ordinary. The other 28 weeks are the lazy days of summer, complete with marshmallow roasting, watermelon seed spitting, and bike riding. We intermingle these sorts of activities with the open space of unscheduled time. For children and for their adults, this is the season of rhythms to build a life on. As we follow the church calendar for our daily family devotions, we find that Eastertide is about celebrations, first and foremost celebrating who we are as redeemed in Christ thanks to the work of the cross, and second as those whose hope is in the power of the resurrection. Personally I love celebrations, I have often thought that if I could do a career change I would be in big event management because I love a good party. I love seeing people come together and laughing together, telling stories, allowing the cares of this world to pass away if only for those few hours. I love Christmas and Thanksgiving and well, every holiday, because I get to use them as an excuse for celebration. A few days ago was my birthday, and every year I struggle with wanting to do some big celebration due to the reasons stated above, however this year I decided that as long as I wasn’t required to homeschool my son and actively participate in normal community life on my birthday I would be content. This was the first year that we has a family celebrated with just us. And it was beautiful. My husband led our children in singing to me happy birthday, not once but three times, with the last time bringing out the guitars (husband knows, son is still learning) while my daughter danced around in joyful glee. It was one of those moments that I know that I will cherish for the rest of my life. Dallas Willard said “We engage in celebration when we enjoy ourselves, our life, our world, in conjunction with our faith and confidence in God’s greatness, beauty, and goodness.” In that moment as we as a family were celebrating my birthday, I felt the delight of God himself in us. Zephaniah 3:17 says that “He will take great delight in you, He will quiet you with his love, He will rejoice over you with singing.” If we serve a God who delights in us and rejoices over us with singing, how much more should we be doing the same thing over each other? In the country where we currently live, rejoicing over others or even with others is not common, it’s actually very rare. Yet I have seen first-hand what power there is in celebrating each other and celebrating with each other. The Bible tells us Nehemiah 8:10 that the joy of the Lord is your strength. I quoted this verse for years and years never realizing that this statement comes directly from a command to go and feast in the goodness of God, to celebrate before the Lord. It literally says to go and feast “for this day is holy to our Lord.” Yes, the joy of the Lord is our strength and it that joy is renewed, our strength is revitalized in the celebration unto God. In light of that, I am now more determined than ever to teach my children how to celebrate, maybe in simpler ways but in every opportunity to celebrate all that God has done for us, through us and with us. I want my children to know the delight that God has in us and how as messenger of His good news, we sure should delight in others as well. When I take stock of all the mothering it took raise me and all the mothering I still need, one person is a great start, but not nearly enough. My cast of mothers crosses all boundary lines, including gender. One of my first memories of being mothered is of my PaPete. The memory consists of me standing on the deep freezer in his deli quoting Bill Cosby and being constantly harassed about food. “Are you hungry?” “You can’t eat a pimento cheese sandwich without chips.” “You want hash browns with your eggs.” If you met him, he’d try to feed you. My Aunt Nita mothered less with what she said and more with what she did. Over a Dr. Pepper she’d listen to my hare brained ideas, and give me opportunities. She believed the very best about me. Jimmy Daniel, my BSU director, mothered me through college. Feeding and challenging me to live into who God created me to be. The woman who actually claims to be my mother has a lion’s share of courage and a fierce protection of her cubs. I remember a day in middle school when a boy I liked, (who didn’t know I was alive), accidently slammed my hand in a door. My mother, “accidently” let the same door fall on his head. She locked eyes with him and said, “Oops, these doors are tricky, aren’t they.” Incidentally this is also the day I most wished for an invisibility cloak. Today those who mother me take the shape of friendships; male or female, we mother each other, we nurture, love, and protect. I burst with gratitude when I see the mothers in my daughters’ lives. My father mothers like no other. He is a professional enabler, enabling these quirky little girls to follow wherever their hearts lead. Our neighbor, Peggy, mothers with her stealthy intellect and wise presence. Jim, mothers by laughing at the jokes of budding joke tellers that fall way short of funny. Russ, our former worship leader, mothered them into the throne room of God and taught them to dance with their soul. I suspect they also will require a small army of mothers. There is one Mother though, one whose presence is constant. I'm guessing that most parents who are following Jesus and helping their kids to live with him struggle in the same way I do. Lately, I've been thinking a lot about who and what is most influentially forming my three kids. When I say "forming," I mean forming them spiritually in a way that affects their identity, their passions, their understanding of living and being in this world, their view of God and what He means in their life. With our youngest child being close to 9 years old and our oldest at 15, immersed in high school life, they are at ages where home, parents, and church are a big influence, but peers, media, and pretty much all of life outside our front door also play a big role in who they are becoming. Many times I have, in my mind, whisked my kids to a remote jungle or a country home far from civilization where all the competing influences would take a much more distant and manageable role in who they are becoming. You can probably relate. God, though, through the Holy Spirit's whispers in response to my thoughts, has affirmed again and again that the Quinns are where He's placed us as a family and we are to choose carefully within this context how we will influence our kids' formation day by day and year by year. Good Dirt. It has been a good and powerful family guide into God's Word and life with Him on this daily journey. Last week we focused with the kids on Jesus' prayer in the Garden of Gethsemane, and the boys drew pictures that they used for a few nights. The boys were instructed to draw a road, because Jesus described himself as the road to God. "With his whole life he showed us how to live a life with God." And then they were told to write on the road some of the ways Jesus showed us how to live a life with God on the road. For three nights we read from Jesus' prayer in Gethsemane, talked about it, and wrote on the pictures. I have given them your word and the world has hated them, for they are not of the world any more than I am of the world. My prayer is not that you take them out of the world but that you protect them from the evil one. They are not of the world, even as I am not of it. Sanctify them by the truth; your word is truth. As you sent me into the world, I have sent them into the world. For them, I sanctify myself, that they too may be truly sanctified. On Night 3 as we began to talk about that very-religious-sounding word sanctify, I realized that God is so "with me" on this hard road of parenting and of yearning for my kids to be formed by God and not by the world. Of all things, just a day or two earlier I had heard a radio preacher talking about sanctification. Being sanctified, he had said, is being "set apart." His words had stuck with me, and that night with the boys this definition was ready and helped to frame our conversation. It gave us a picture of who we are as people who want Jesus as our Life. We are different. We are chosen. We, indeed, are ones who are set apart, belonging to God. When I was a teenager and going through family crisis, a friend gave me Oswald Chambers' devotional book, My Utmost for His Highest. I dove into this classic book that focuses so deeply on sanctification. I underlined like crazy and I prayed a lot that God would work out this process of sanctifying my life for Him. Chambers is more wordy when he talks about sanctification, but just like the shorter definition, he gets to the heart of what God does in us, if we allow it. "In sanctification the regenerated soul deliberately gives up his right to himself to Jesus Christ, and identifies himself entirely with God's interest in other men [and women!]." And, "Are we prepared for what sanctification will cost? It will cost an intense narrowing of all our interests on earth, and an immense broadening of all our interests in God. Sanctification means intense concentration on God's point of view. It means every power of body, soul and spirit chained and kept for God's purpose only. Are we prepared for God to do in us all that He separated us for? ... Sanctification means being made one with Jesus so that the disposition that ruled Him will rule us. Are we prepared for what it will cost? It will cost everything that is not of God in us." Sobering words. They give me pause, once again, as I consider my own life. This idea of being set apart, though, isn't too big or too incomprehensible for my kids. Even on a night when they are a little distracted, are trying to fidget with each other, and one is dissatisfied with his drawing, I know they get it. I know they can understand that it's really special to be set apart. And that God deserves all of us. So today, and again tomorrow, we enter another day seeking to live it all, and give it all, for Jesus, for we are "not of this world." And we're also not doing any of it without God's help. ***Parent friends and readers--It is a comfort and much-appreciated joy to walk this road of parenting with you, in community with you through the writing at this site. We are all in different places with God and with our kids as we parent. If you sense Jesus drawing you to come to know Him as you read here, know that you and your children, too, are chosen by God to belong to Him. You and your kids can come to know God by praying simple prayers to God together and by reading the Bible together, listening to God speak to you. Any of us who are writing here would love to correspond with you, just as a follower of Jesus who lives near you would also love to do. Reach out--we need each other as we journey with God! Easter is over... but some of our questions still remain. All of our kids are adopted and we knew that someday they may want to know more about their story. Our daughter is 15 and very 15. She is fun loving and sensitive. She is searching and pushing. She is sad about some bad decisions. She wants and needs love. She does not want to talk to many people about her adoption. She is not embarrassed or afraid she just isn't sure what she thinks, what she knows or what is right. According to Websters dictionary adoption means to take by choice into relationship, to choose to embrace as one's own. Adoption to us means family and inheritance. We have NO QUESTION that these 3 kids are our very own. They could not be more ours than if they looked like "Mini-me's". We do not question or wonder or doubt. We would lay our lives down for these 3 amazing beautiful people we call ours. When we chose to adopt it was because we wanted a family. We chose adoption before any medical option for pregnancy. After Isabella came to us we never considered another route. She is ours. She is our 1st born. There are no doubts. So we wonder why would she question and doubt. Then I realize that this is a picture of us and God. We are adopted by God. We are his chosen heirs with Christ. We search and push and wonder if God knows, cares or loves us at all sometimes. John 1:12 -But to all who believed him and accepted him, he gave the right to become children of God. Romans 8:14-16 - For all who are led by the Spirit of God are children of God. So you have not received a spirit that makes you fearful slaves. Instead, you received God's Spirit when he adopted you as his own children. Now we call him, "Abba, Father. "For his Spirit joins with our spirit to affirm that we are God's children. Galatians 4:4-6 - But when the right time came, God sent his Son, born of a woman, subject to the law. God sent him to buy freedom for us who were slaves to the law, so that he could adopt us as his very own children. John 3:1-2 - See how very much our Father loves us, for he calls us his children, and that is what we are! Galations 3:29-And if you belong to Christ, then you are Abraham's descendants, heirs according to promise. God has no questions, no doubts. We do. We wonder and wander and push and search. To HIM he just waits for us to realize that we are His and have been all along. The David Crowder song "How He Loves Us" describes it well. He is jealous for me, Loves like a hurricane, I am a tree, Bending beneath the weight of His wind and mercy. When all of a sudden, I am unaware of these afflictions eclipsed by glory, And I realize just how beautiful You are, And how great Your affections are for me. He loves us, Oh, how He loves us, Oh, how He loves us, Oh, how He loves. Yeah, He loves us, Oh, how He loves us, Oh, how He loves us, Oh, how He loves. As we walk through these questions of adoption and belonging with our kids we will remember that we feel the same sometimes. We question "WHY? WHY would God die for ME? Does He even know or care..." and then I think of MY kids and know. OH! HOW HE LOVES US! My favorite church service of the year is the Easter Vigil. For those who don't know, the service is built around the movement from dark to light, the movement from death to life. It has hours (2 hours for us) of Scripture readings that trace "The story." Adam, Noah, Abraham, Issac.... you get the point, there is singing interspersed and responsive readings. All the while the building is moving from dark to light. The readings are done by candle light (candles that have been lit by the Christ candle) and each person in the congregation is holding a candle as well... for nearly 2 hours. For nearly 2 hours I sat by children with fire. After an hour and a half one gave up, but honestly its nothing to be ashamed of... she fought the good fight. There were several close calls, like the first time hot wax fell on her hand and she refused the urge to drop the candle into my lap. This is the child who has naturally curly hair and likes to wear it long and wild, and therefore we did slightly exude the smell of burnt hair, but only briefly. Round about minute forty a sneezing fit nearly blew the light out. But no, she kept it safe and lit. It was shining bright in the darkness making it possible for us to read and therefore pray with the rest of the congregation. That little light made it possible to worship and to hear "the story." When she was too tired to hang on safely, I held it for her. She curled up next to me and slept, after making me promise to wake her for communion. It's her first communion after being recently baptized and this was a big deal for her. Managing two candles and a fire friendly paper prayer booklet was a harrowing task. All my senses were focused on not burning the church down. I had to mind the light. Mind the Light is a Quaker phrase. It means to pay attention to the light of Jesus within us, is it bright or dim? Is it going out, or setting our neighbor on fire? There are two ways to be a light to those around us, one is harmful and can leave permanent damage, the other shows the way, brings warmth. This is what we're talking about these days. Minding the Light. In the evening, How did I mind the light of Jesus today? So it's the evening of Easter Sunday. Jesus is the light, how are you minding it?